The experiences, from auditions to graduation, of students at the New York High School for Performing Arts, Fame is one of Hollywood's best musical dramas. Doris (Maureen Teefy) is studying to be an actress, but she sees herself as exceedingly plain and not anywhere near glamorous enough to become a successful star. Ralph (Barry Miller) and Montgomery (Paul McCrane) are also studying drama: Ralph is obsessed with the life and death of stand-up comic Freddie Prinze; Montgomery is dealing with being gay. Coco (Irene Cara) is an ambitious singer, eagerly looking for her big break. She teams up with keyboardist Bruno (Lee Curreri), who has the talent but not the people skills to promote his electronic music. 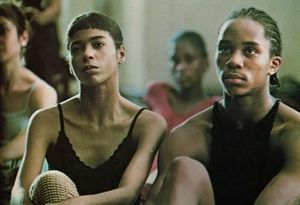 Leroy (Gene Anthony Ray) is a terrific dancer but cannot succeed at school because he's illiterate; Lisa (Laura Dean) wants to be a dancer but has neither the natural talent nor the work ethic to succeed. Director Alan Parker invites us into the lives of these students using a documentary, gritty approach. With the absence of any stars in front of the camera, and making full use of a Manhattan yet to be scrubbed by corporate dollars, the result feels exceedingly real, as if Parker and his cameras were genuinely intruding into the lives of the students. The script, by Christopher Gore, effectively creates a multitude of well-rounded characters, who evolve from the nerves of auditions to the confidence of their senior year within two hours. Making each scene count, every student gets a back-story that enhances their personality without detracting from the focus on their high school years. Fame succeeds in avoiding cliches and most importantly, Parker stays true to his emphasis on reality by eschewing any and all nicely wrapped-up happy endings. We leave the students certainly four years wiser that when we first meet them, but they all have significant unresolved conflicts and challenges still to be overcome. Within all this emphasis on genuineness, Fame also has a lot of fun. In particular, two musical song and dance numbers are outstanding: the Hot Lunch Jam in the school cafeteria and the celebratory song Fame shutting down a Manhattan street are both spine-tingling classics. Of the cast members, Irene Cara was catapulted into immediate super-stardom by the success of the songs Fame and Out Here On My Own. The other actors, surprisingly and ironically, achieved little subsequent success. They did, however, leave a terrific legacy in their one shot at fame.